The temperatures have been creeping up here in New England and while we rarely hit the 90° mark - the heat and humidity still cause issues with skin and makeup, like sweating off. I wanted to share a few makeup items that have been lifesavers for me and help keep my sweat at bay and keep my skin looking fresh! If it's hydration you are seeking then look no further than Neutrogena's Hydroboost. After the shower I like to hydrate my face immediately! I first mentioned Neutrogena's Hydroboost in March (I had already been using it since January) and I recently finished up the bottle - that's a solid 5 months of use, a pretty great $19 ROI if you ask me! My skin soaks up the water gel, which feels like a really light moisturizer. I have normal skin, but after the shower it feels rather dried out - so this helps bring it back to life. A couple weeks ago I received my Sephora Play Box for June and while I won't be reviewing all the items in the box, there were 2 new to me products that I couldn't wait to try and have been using every day since. I have been starting every day out with the Tarteguard SPF 30 sunscreen - the smell is unlike any other face sunblock I've used - it smells amazing. I'm not going to sugarcoat it - it's expensive. The way I make the most out of the sample I got, which is even smaller than their $12 size, is mixing it in with the Backlight Priming Filter from Becca that was also in the June Play Box. Both are free of harmful chemicals and leave your skin with a glowy, dewy finish. Together these two products are A+! The primer from Becca gives you just a hint of glow, but not like a highlighter, rather it diminishes the appearance of unevenness in skin tone, but it doesn't have any color to it, just a primer. If you love the sun kissed look then odds are you like the look of highlighters. The only highlighter I use is the Becca x Jaclyn Hill Champagne Pop. After a year of use, I've barely made a dent, but with very little product needed you will have this for a long time! I like the look of the sun reflecting off the high points of my face and giving that glow. After one too many bad sunburns (one of which resulted in sun poisoning a few years ago) I have given up the quest to be tan from the sun - instead I leave it to a little bottle of St. Tropez "One Night Only" bronzer. It comes in both light and medium (I use the light) and it is FOOL proof to put on. I have used it for a year now - same bottle too - and apply it to my legs when wearing a skirt or shorts and also to my arms. Everything else already has a nice color to it. If you mess up - don't worry because you can wash it right off! If I want a tan to last a bit longer then I use Jergens Natural Glow Instant Sun (comes out like a mousse) and apply it with a hand mitt. It does stay on for about 2-3 days - perfect for a long weekend! To finish off the makeup look I always go back to my trusty friend - the Urban Decay Setting Spray. The travel size for $14 will last you a long time - mine usually lasts at least 5-6 months. My uses include days that I have an event after work, weekends that I know I'll be out all day, days that it's going to be really hot and I want my makeup to stay put and a night out! I can't leave home without my evian mist spray in the Summer. It is a life saver when it's super hot out and you feel like you're a sticky mess. I've mentioned it a few times before, but in really hot locations and destinations - you need this with you! It's TSA approved so bring it on the plane with you to reinvigorate you after a short or long flight! 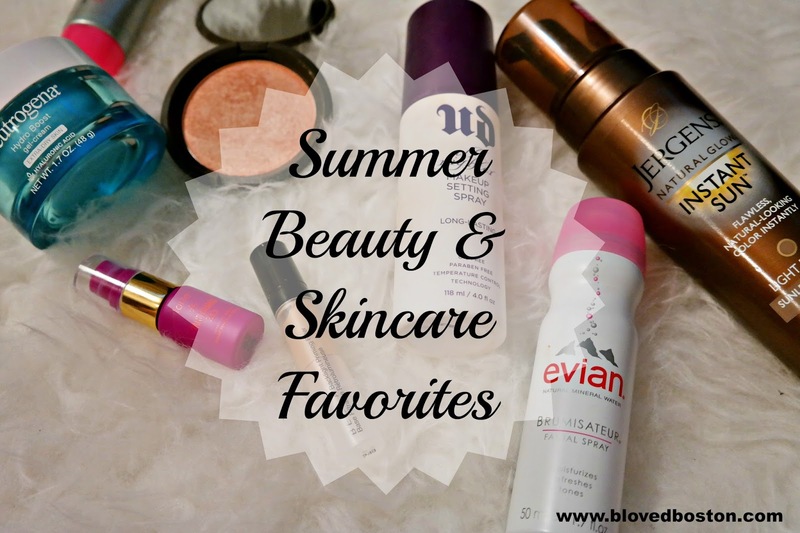 What are some of your Summer makeup and skincare favorites? I've heard the Evian mist spray is wonderful!! Going to pick up a little can before our vacay. Great products to beat the summer heat and you always look gorgeous so must be doing their job!! I have never heard of the the urban decay setting spray. I need to look into that! The Evian mist spray sounds perfect though for these gross summer days! Gosh I'm terrible at remembering to use my UD setting spray when it's so needed in this heat. The Jergens Instant Sun sounds amazing...I'll have to try that one out since I'm always looking for a little tan booster. I love the Urban Decay setting spray! I can't get over how well it works, and it doesn't irritate my sensitive skin! I still need to try the Evian spray, I've heard so many wonderful things! I have been dying to try champagne pop. Everyone seems to love it! I think it might be my next makeup purchase! And the Evian spray -- good to know that it's allowed on the airplane! Sun poisoning!? Eek. 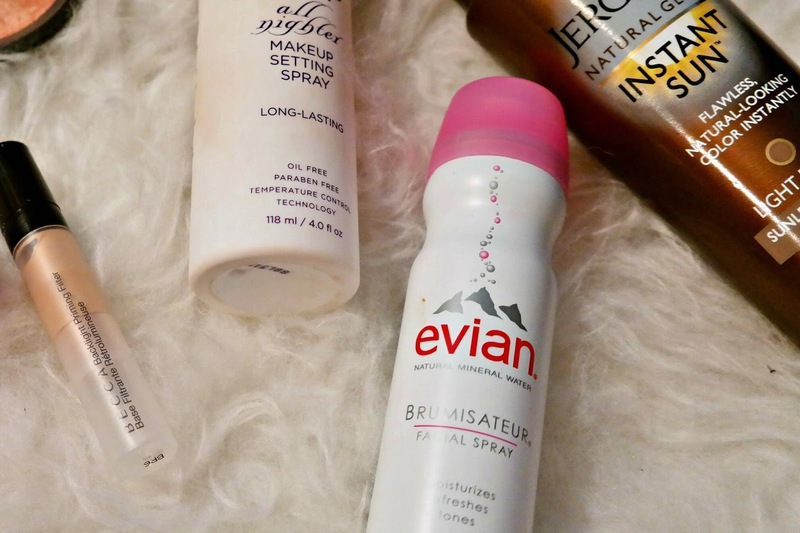 I love the Evian spray and now I want to try the makeup setting spray! That Evian mister was the savior last year in Charleston ;-) The UD setting spray is the holy grail and I totally agree with you about the St. Tropez tanners, they are the best! I have never used the Evian spray mist, but I continually hear such great things about it! So many of these are my favorites too! That Becca primer and Champagne Pop highlight are just the best for summer! I'll have to pick up that Evian spray for our upcoming trip to Cali! I'm thinking I may need to buy the Evian spray just to try it! And I use the Becca highlight in Moonstone--when I went to my local Sephora, they were out of the Champagne Pop and now I kind of wish I had it! And like you said, it's going to last forever so it may be years before I run out of my current and get to buy the other! The thing that caught my eye is that they now have instant tan!!! That is literally insane! I must try this asap! I also need to they the Evian spray asap I hear so many good things! You have inspired me to up my makeup game! There are some days that I wonder why I even put makeup on! As soon as I walk out the door it's gone! 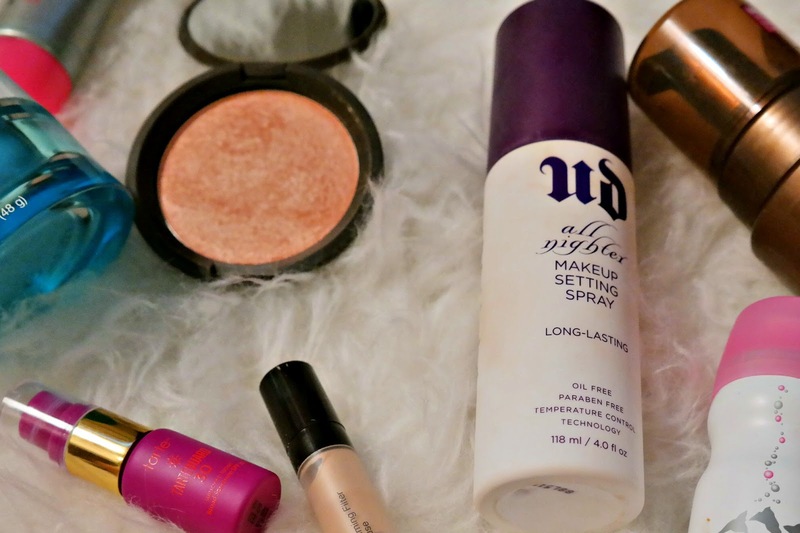 These sound like some great tips to try and I swear by the Urban Decay setting spray! I love that Tarteguard sunscreen too! I really need to pick up the Evian spray and keep it in my beach bag. 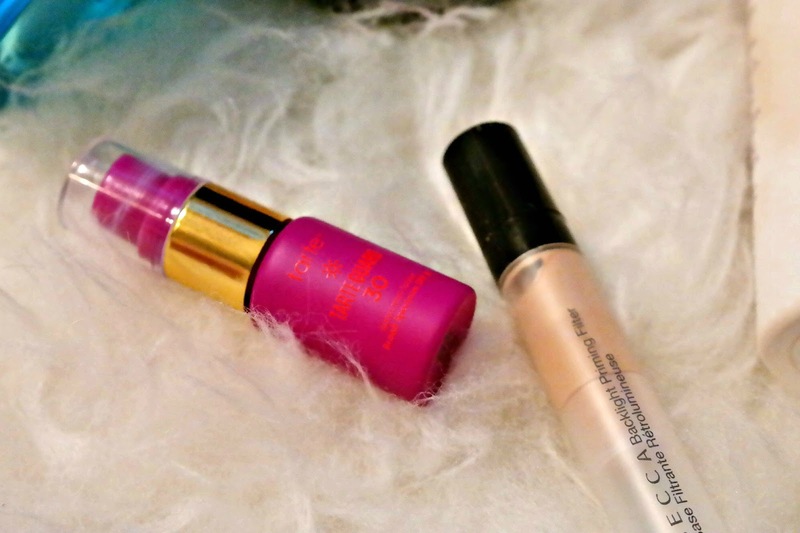 The champagne pop highlighter is on my list to try! Thanks for sharing all of these great products! I keep meaning to grab the Evian spray when we travel. Heard amazing things about the setting spray, on my list again. I desperately need to get the Evian spray! I always seem to forget when I'm at the store! I've heard good things about that mist spray... I definitely need to try it for our HOT and humid summers here in NC! I love love the Evian Spray. I always have it in my bag during the summer. I haven't tried the Becca Primer that came in the June Play! Box. I was pretty excited that it was included. I really liked the perfum that came in the box too. It smells so good. I finally moved off the waitlist for the Sephora Play! box!! I learned about it from your blog, so thanks for sharing. Can't wait to receive next month's box! I need to try those self tanners you mentioned.. 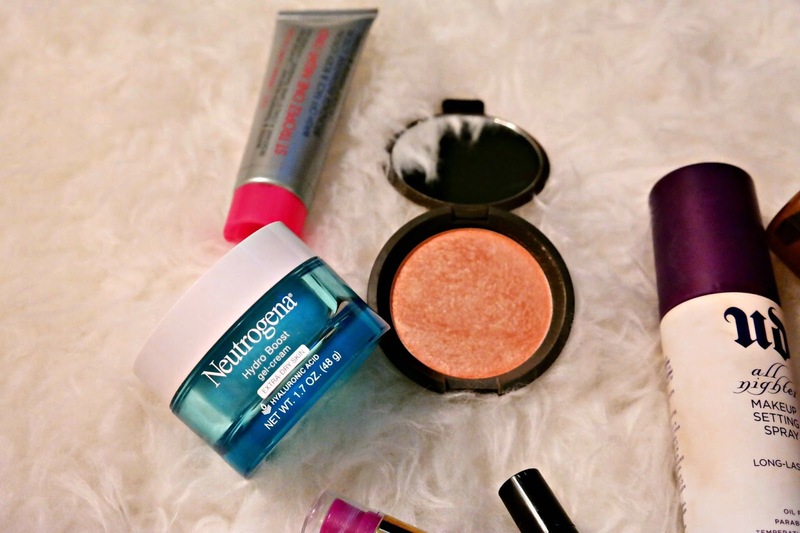 I still have that neutrogena on the possible things to try list! I've been eyeing the Evian Spray, think I just need to bite the bullet get some and keep it in my bag. I've never tried that evian spray, but have always heard such good things. I should pick some up, especially with how humid midwest summers can get! I am loving my Evian Mist and the Urban Decay spray is also a must. I'm totally obsessed with Champagne Pop and got the Becca primer in a sample but haven't used it yet...sounds great! Jergen's Instant Sun! I need to try that ... and loving the Evian mist too. I always take those on flights with me. 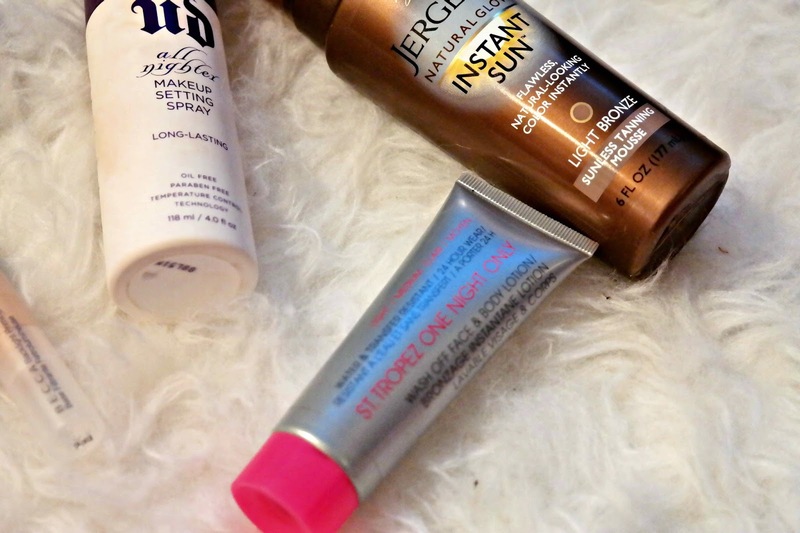 I use the St. Tropez foam self tanner & LOVE it! Evian mist is a definite must year round for me. I use it every morning to set my makeup or refresh it in the evenings and I LOVE it! You've got some really interesting products that I've heard of, but want to try now! I've heard so many great things about Champaign Pop, but my skin is sensitive and I believe I'm allergic to Talc, so I have to check out the ingredient list first, I hope it doesn't have it! I also want to try out both the Urband Decay and Evian sprays. I'm glad you mentioned how long the travel size for the UD one lasts because I had it in my hand at check out at Ulta and put it back because I wasn't sure about how long it would last for the price. I also need to check out the self tanners you've mentioned because I've been trying to avoid the sun, too, which is SO hard because I tan so easily. I will literally walk outside to my car and back in and I'll already have tan lines, haha. Thanks so much for sharing, beauty, and I hope you have a great rest of the week! I've heard amazing things about that Jergans tanner! I need to give it a try! Will be perfect for summer! I see a few of my favorites here! I have yet to try the sunscreen from the Play box and the primer! I also LOVE the UD setting spray one of my FAVORITES and the Evian spray is also a well loved product of mine! I've been meaning to try the Hyrdro Boost, great to hear that you love it! I also can't live without my Evian Spray- have one in every bag and at my desk- life saver!! I love Evian misting spray! Best summer product out there! I'd like to try that Jergen's Natural Glow. That's what I always wear, but I have the lotion that gradually tans you and it seems to take too long. I wonder if the mousse tans you faster?? I was so in love with the Play! box this month! I'm really excited to try out the Tarte Sunscreen and the Becca primer looks so awesome! I can't get enough of my Jaclyn Hill Champagne Pop, and if I didn't use a setting spray my makeup would just melt off of me! I love all of your favorites! I need a new make up setting spray and now want to check out the Urban Decay one. I have some of their other products, but this one is big on my wish list. Jergens can do no wrong - so I may need to try this out! Such a fun post - I love your beauty tips/tricks! I love the Tarte sunscreen! I can't say enough good things about that! I have to get some One Night Only to try for big nights out, it's such a fun product idea! Awesome products girl! I love the travel sized UD setting spray, lasts forever and works perfect! I have the Jergens tanner as well and like it, along with my St. Tropes tanners. Love getting that little glow in the summer! So strange, my Bloglovin account never showed this post from you! Bizarre?? The UD setting spray is my favorite. It works so well! I have been using sunless tanner lately, and I love it! Such a great glow. I'll have to try the product you mention. Looks neat! I'm intrigued by the Neutrogena Hydroboost. I may grab it the next time I'm at the store! These are awesome beauty picks, lady! I need to try that gel moisturizer from Neutrogena- I've heard such good things! And moisture is SO key. Love that Jergen's self tanner; I have it in my arsenal and use it allll the time! I have been looking for a new moisturizer and am running out to try the Neutragena. I also love that Jergen's self tanner, I use it a lot. I like it better than the lotion. Thank you for sharing, I enjoyed reading this post. I need to get that St Tropez--I have the regular gradual one, but this sounds great for instant! That setting spray has been a lifesaver for me this summer! I've been wanting to try the UD setting spray. Good call on the travel size, that's perfect to try out! I love UD setting spray! The best! Ooooh I use the Jergens but have got to try the temporary option. Thanks for sharing girl! That Urban Decay makeup setting spray is amazing! Thanks for sharing so many awesome new to me products too! I love the Sephora products! I will love to try the sunscreen. I'm SO GLAD you shared about Thumbtack! I just played around on the site for 30 minutes and requested two jobs to be done around our home. Such a fab site and idea! Thanks girl! I've heard nothing but amazing things about that Urban setting spray, it sounds essential for summer make up. that evian stuff is amazing, especially for flying. i only just started using it fairly recently and it makes a world of difference! never thought to use it in normal life as well, i'll have to give it a go!